Dr, Bhakta is amazing. I had been years ago for a cortisone shot in my heel and he made it aspainless as possible and helped ease my nerves by chatting and making me laugh. Today I had to go in for an infection and ingrown toenail removal surgery and once again was so pleased with how professional him and his team are and how they made me feel so comfortable. So grateful to have a Dr that I can trust. I am recommending anyone who needs help with their feet to Dr Bhakta. Thank you for keeping my feet confortable !! Dr, Bhakta is amazing. I had been years ago for a cortisone shot in my heel and he made it as painless as possible and helped ease my nerves by chattingand making me laugh. Today I had to go in for an infection and ingrown toenail removal surgery and once again was so pleased with how professional him and his team are and how they made me feel so comfortable. So grateful to have a Dr that I can trust. I am recommending anyone who needs help with their feet to Dr Bhakta. Thank you for keeping my feet confortable !! His bedside manner is great. He made me feel comfortable. He explained what the problem was and what I had beendoing wrong. He gave me information which I needed in order to continue forward. He made a couple of jokes along the way which made me smile. This was my first visit with Dr. Bhakta and I will continue to use him as my podiatrist. His bedside manner is great. He made me feel comfortable. He explained what the problem was and what I had been doing wrong. He gave me information which I needed inorder to continue forward. He made a couple of jokes along the way which made me smile. This was my first visit with Dr. Bhakta and I will continue to use him as my podiatrist. Dr. Mukesh Bhakta has been in private practice since August 2000. He is Board Certified by ABMSP, member of The American Academy of Podiatric Sports Medicine, American Podiatric Medical Association and The Viriginia Podiatric Medical Association. 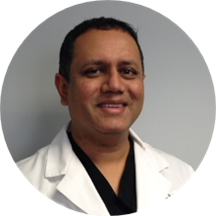 Dr. Bhakta earned his Doctor of Podiatric Medicine at Scholl College of Podiatry in Illinois. He completed a 2 year residency at the St. Louis VA Hospital/Scott Air Force Base with rotations at NNMC-Bethesda. Dr. Bhakta's particular areas of interest include podiatric sports medicine, foot surgery and pediatric foot problems. He has been playing sports his whole life and knows how many of the injuries feel(e.g. he has given himself cortisone injections for plantar fasciitis). He works closely with The Running Store (no affiliation) for proper shoe fitting and gait analysis and other local vendors. He is on staff at Novant Health Prince William Health Center and Novant Health Haymarket Health Center. Dr. Bhakta does his surgeries at NH Prince William Health Center, NH Prince William Ambulatory Surgery Center and the new Haymarket Surgery Center which just opened in 2014. Dr. Bhakta is married with a son and daughter in middle school. His wife is a Family Physician in South Riding. He has also enjoyed coaching both his son’s basketball team and his daughter’s soccer team. In recent years, his form of exercise has shifted to running, cross training, biking and weightlifting. He still enjoys playing golf and basketball. His hobbies include traveling, hiking and home improvement projects. I was very pleased from making the appointment til the appointment. I can't believe how fast I was in and out of the office. This was my first visit with Dr. Bhakta. The woman who checked me in, Jessica, was extremely friendly! My foot required x-rays and a cortisone shot, which Iassumed would require an hour of waiting (like my primary doc) but they did it right away. Although they were quick, I also did not feel rushed out the door. They took the time to answer all of my questions. I would highly recommend Dr. Bhakta's office! I was confident with the diagnosis was accurate and that the treatment will be effective. Dr. Mukesh Bhakta and his staff were amazing! I came in today to have an ingrown toenail treated, and it was painless! I was incredibly nervous about the procedure, just the thought of the procedure made me cringe. However, the staffand Dr. Bhakta were great and explained everything in detail, and I didn’t feel a thing. 10/10 would highly recommend! As always, everything was great. I found Dr Bhakta and his staff warm and friendly. I felt like I had been there for years except that I was a new patient today. Excellent explanations. I was nervous about receiving a cortisone injection. It was Virtually pain free. Awesome doctor! I will definitely refer him and see him again for other podiatry needs!! His nursing and front desk staff are also top-notch: they worked quickly and proficiently, and knew what they were doing THE FIRST TIME!! I was in and out in no time! First time patient. Very good experience. The doctor and staff were all polite and filled me with confidence! Dr. B knows his stuff. Have had chronic pain due to hammertoe. Talks you through process and makes you feel at ease. Great doctor for teachers! Not someone I would go see based on this experience. Friendly and warm in manner and very professional and well-versed in his field. My impression of him was a good one. Seems very knowledgeable and has obviously treated my particular problem before. All staff were very professional and made me feel comfortable before surgery. This is my second appointment with Dr Bhakta. Highly recommend. Dr. Bhakta was very personable, very professional and gave me a lot information. Office staff was excellent too. Highly recommend. Dr. Bhakta is great! He’s knowledgeable and personable. He’s helped with the pain my Morton’s neuroma causes, which I am very greaterul. Highly recommend him! Everything went perfectly from making the appointment online to downloading the new patient forms to the actual doctor visit. Highly recommend this practice. The office staff were very nice, the nurse was friendly and reassuring, and the doctor was exceptional. He was friendly, personable, and he performed my procedure quickly and painlessly. I highly recommend Dr. Bhakta. Dr. Bhakta is wonderful! He is kind and patient and I highly recommend him. I am so pleased with Dr. Bhakta. His bedside manner is awesome and he explains everything to you to make sure you understand. I felt comfortable with him immediately. He just gives off good vibes. His diagnosis took away my anxietyand I would highly recommend him to anyone who needs a podiatrist. Office staff were professional and efficient. I was seen on time and and my issue resolved. They were even able to do x-rays during the appointment to help make a quick and accurate diagnosis. He was great! He was reassuring, informative, and has wonderful bedside manner. He did not have that pompous doctor attitude that I come across often, but was helpful and listened. Most of all, he has these awesome adhesive dressings calledCoverlet that are the most comfortable bandages I have ever worn, and because I told him how much I loved Coverlet, he gave me extras. He is super nice! I highly recommend!